President Tran Dai Quang has urged Vietnamese scientists and experts worldwide to take an active part in transferring technologies, training high-quality personnel and other activities serving scientific-technological and socio-economic development at home. 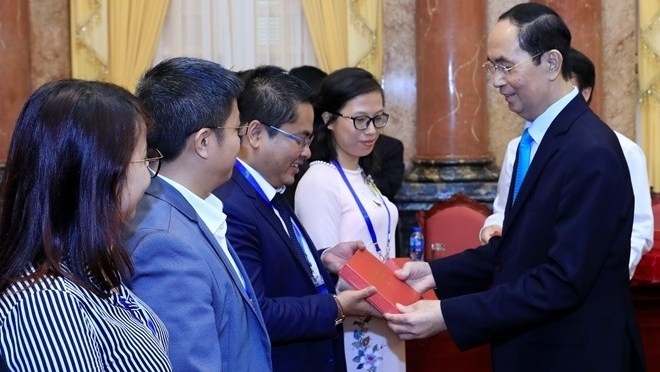 He made the appeal at a meeting in Hanoi on August 18 with 100 outstanding overseas Vietnamese in science and technology who came home to attend an innovative network connection program from August 18-24. Turning Vietnam into a developed and prosperous nation driven by high technology is the responsibility and aspiration of Vietnamese from all over the world, the leader said, stressing that to that end, it requires joint efforts of Vietnamese people. President Quang affirmed that the Party and State always attach importance to policies on attracting Vietnamese talents worldwide to national development, especially in the context that the Fourth Industrial Revolution is developing robustly and science-technology have played a decisive role for developing nations to catch up with advanced ones. Many policies have also been rolled out in Vietnam, aiming to encourage scientific-technological development, he said, citing the innovative and creative network as an example. Valuable contributions by overseas Vietnamese scientists and experts have helped Vietnam keep pace with the world in terms of technology, the President noted. He asked the Ministry of Planning and Investment to join hands with the Ministry of Science and Technology, and other relevant ministries and agencies to cooperate with Vietnamese scientists, experts and businesspeople abroad, thus improving the efficiency of the innovative networks. Many delegates said they want to return to Vietnam to support ministries and agencies through specific projects. 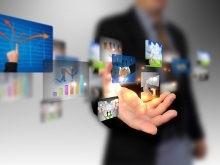 With its existing potential, Vietnam can develop strongly in the time ahead, they said, suggesting their homeland promote research studies and applications, and create conditions for startups. 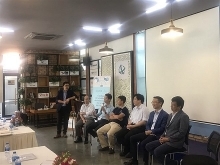 To access the Fourth Industrial Revolution more rapidly and specifically, Vietnam needs to have a clear legal framework for artificial intelligence (AI), data mining and blockchain, they said.